Wearing perfume is an art and a science. Where to apply perfume, how to apply it and what type of perfume you’re using make all the difference in whether it makes you smell good, or…bad. When used correctly, perfume can complement your outfit, enhance your beauty, and even ignite chemistry and desire in others. But the opposite holds true when you wear perfume incorrectly—incorrect use of perfume can not only be embarrassing and leave a bad impression on others but make people actually avoid being around you. You wear perfume to smell nice and feel more beautiful and desirable. And it’s probably your worst nightmare that it would instead make people think “Ugh” as you walked by, right? Without the correct usage, it might’ve even happened to you already. 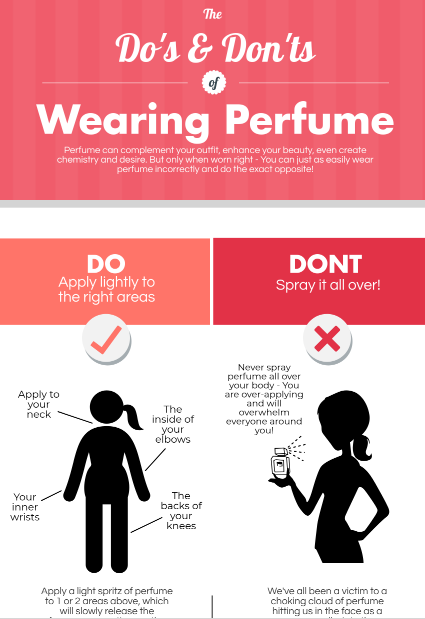 That’s why you need to follow these important do’s and don’ts in order for your perfume to have your desired effect.